Saving for retirement is one of the most important financial matters that people face during their lives. Whereas the Dutch on average accumulate sufficient retirement wealth, quite a few people nonetheless end up with lower savings than they expect or need. In this light, it is surprising that many people do very little to adapt their expectations or to adjust their saving strategy. People are inert. They remain inactive even when action is needed. This Netspar Survey Paper addresses two questions about inertia. 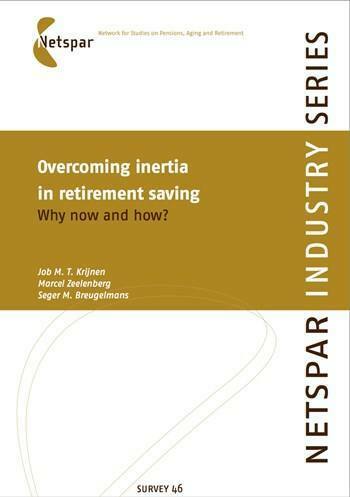 First, what reasons are there for inertia in retirement saving? Second, how can our understanding of these reasons contribute to current and future developments in the Dutch retirement system? Reasons for action are primarily financial. Inertia leads to financial loss. However, when people do not understand this financial loss, or when they neglect or underestimate it, they do not take action. Reasons for inertia, on the other hand, are primarily psychological. Inertia can be motivated by an expected increase in accuracy, avoidance of potential regret, increase in confidence, retention of flexibility, present-biased preferences, and undue optimism about the future. This analysis of the reasons for action and the reasons for inertia provides one crucial insight: whereas many people know why they should be saving for retirement, they do not know why now and how. We will address these issues extensively. In a final section, we make several recommendations, structured around two questions: (1) ‘Why should I take action right now?’, and (2) ‘How should I take action?’.